Willi Wesley trots to a top finish in the Grade Ib team test with rider Sydney Collier. Photo copyright SusanJStickle.com. Jupiter, FL – September 26, 2014 – Horse Radio Network’s once-a-month Para-Equestrian Show featured U.S. World Equestrian Games (WEG) Athlete Sydney Collier and her WEG coach Wes Dunham. Lindsay McCall from the United States Para-Equestrian Association (USPEA) hosted the show with co-host Regina Cristo. To listen to episode #278, please visit: http://dressageradio.horseradionetwork.com/2014/09/25/dressage-radio-episode-278-para-dressage-wraps-2014-weg-with-sydney-collier-and-coach-wes/. 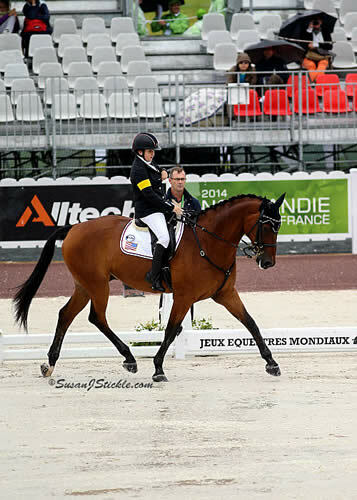 Sydney Collier of Ann Arbor, Michigan represented Grade Ib for the USA at the 2014 Alltech FEI World Equestrian Games. This was her first World Equestrian Games at the young age of 16. Collier rode Victoria Dugan’s Willi Wesley, a 2000 Warmblood gelding. At age seven Sydney was diagnosed with Wyburn-Mason Syndrome after she began having blurry vision. Wyburn-Mason Syndrome is a rare, congenital disorder characterized by arteriovenous malformations in the central nervous system and retina. It affects only .14% of the world’s population and can cause brain hemorrhaging, stroke, paralysis, or death. In 2010 at the World Equestrian Games in Lexington, KY, Sydney and her family ran across young para-equestrian Jonathan Wentz. Wentz introduced Collier to trainer Kai Handt and veteran Paralympian Hope Hand who is President of the United States Para-Equestrian Association. Not long after the 2010 World Equestrian Games Collier began training as a Para-Dressage rider eventually pairing up with Paralympic Dressage coach Wes Dunham of Millbrook, NY. In 2012, young rider Collier had not yet reached her 16th birthday before the 2012 Paralympic Selection Trials but she did earn the opportunity to compete at the 2012 USEF Para-Equestrian Dressage National Championships. The valuable experience of showing at the National Championships that year gave her the verification she needed to know that she was ready to aim for the 2014 WEG. Collier and her coach Wes Dunham have been working together over the past two years creating the perfect partnerships with multiple mounts. Collier began riding Wentworth (owned previously by Amy McIlwham) in 2013 and competed internationally with her horse that same year. In 2014 Collier added two new mounts to her line-up scoring top rankings in Grade Ib. Collier earned a spot on the U.S. WEG Team in June 2014 with horses NTEC Cuplee and Willi Wesley. Collier and Willi Wesley were successful at the 2014 Games. The WEG was Collier’s first overseas trip for Para-Dressage and a dream come true for the young athlete. Born and raised in western New York, FEI rider and trainer Wes Dunham began his life-long love of horses at the age of 6. He competed in Western Pleasure classes before turning his attention to Eventing, Show Jumping and ultimately Dressage which he currently coaches and trains. While completing his Master’s in Education, Wes dedicated himself full-time to a career in the sport. Wes has been awarded his USDF Bronze and Silver medals, and is currently working towards his Gold. Most recently, he coached an FEI para-equestrian athlete and student on his own mare “Western Rose,” helping the pair to earn a spot on the U.S. Paralympic Team competing at the 2012 Paralympic Games in London. 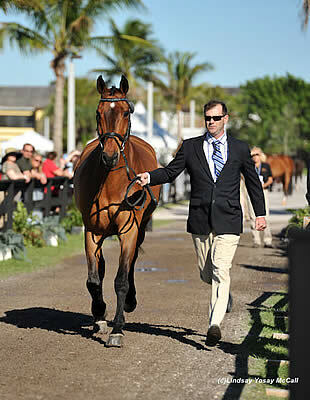 Wes has been working with multiple Para-Dressage athletes including WEG U.S. Team member Sydney Collier and hunter/jumper rider Elizabeth Traband. As an FEI coach Wes has trained at the 2012 Paralympics and the 2014 Alltech FEI World Equestrian Games in Normandy, France. Wes trains in Millbrook, New York, at Woodstock Stables. Sydney Collier and her dog Journey at the 2014 Alltech FEI World Equestrian Games. Photo copyright SusanJStickle. They say some living things are “old souls.” If that’s true, then Sydney Collier is one of them. With her huge, earnest, round blue eyes and round rosy cheeks, the pint-sized Collier bears a certain resemblance to an oversized Raggedy Ann doll. (She even has the reddish hair, although hers is cropped close.) But the sixteen-year-old para-equestrian dressage rider’s articulate speech and positive, thoughtful nature belie her young age. Collier has lived with medical challenges for half her young life. At the age of eight she was diagnosed with a rare condition called Wyburn-Mason syndrome, which causes vascular malformations within the brain and causes other side effects, including one that befell Collier when she lost vision in her right eye and had coordination problems on the left side of her body. Then in 2009, when Collier was 11, she was undergoing one of the three brain surgeries she endured that year when she suffered a stroke. The stroke left her with hemiparesis (one-sided weakness) on her left side. It was time for a little luck to come into Collier’s life, and the lucky break took the form of a trip to Lexington, Ky. In 2010, the year after Collier’s stroke, the Kentucky Horse Park hosted the Alltech FEI World Equestrian Games – which also happened to be the first WEG held in the United States and the first to include para-equestrian dressage. Collier traveled from her home in Ann Arbor, Mich., to Lexington to watch the competition. “That was when it really clicked for me: Even though I have these physical challenges that make me have to do things differently, I still can ride at the level I want to ride,” Collier recalls. The 2010 WEG was also the site of the meeting that changed Collier’s life. She befriended the young US para-equestrian dressage rider Jonathan Wentz, who “got me connected with the right people” and whom she calls her mentor. Collier’s quest to reach the international levels of para-dressage has led to a vagabond existence. While the rest of the Collier family remains in Michigan, Sydney and her mother, Anna Collier, rent a house in Millbrook, N.Y., so that Sydney can train with FEI-level instructor/trainer Wes Dunham at his Woodstock Stables in Millbrook. Dunham also coaches para-equestrian Donna Ponessa, who rode Dunham’s mare Western Rose in the 2012 Paralympic Games in London. “Syd’s ParaQuest,” as Collier calls it (her website is www.sydsparaquest.com), next led her to Texas, home base of Kai Handt, the US para-equestrian dressage chef d’équipe. Collier was riding two horses based at Handt’s North Texas Equestrian Center in Wylie, Tex. : NTEC Cuplee, a six-year-old Mecklenburg gelding owned by Patricia McIean Mendenhall; and Willi Wesley, a 14-year-old Hessen gelding owned by Victoria Dugan. “It’s been a lot of traveling for us the last few months,” Collier says, referring to the trips to Texas to ride with Handt. Collier’s sunny attitude extends to her experience in Normandy, where she is competing in the Grade Ib division. Her first tests at a world championships haven’t been mistake-free, but like any dedicated dressage rider, she is matter-of-fact about what needs to improve. “I would like to work a lot on my center lines and get them as perfect as they can be,” she says after her Grade Ib Team test, her first time competing in the arena at the WEG para venue, La Prairie Racecourse. “I also want to work on my geometry because I’m three-fourths blind, actually. It helps a lot when I have that extra time to become familiar with the arena,” she says. Collier has attracted a lot of media attention at these Games. For starters, she’s the youngest para-equestrian here. For another, she makes for ridiculously easy photo ops because she’s the only WEG competitor accompanied by a dog. In 2012, mere weeks after competing in the London Paralympics, Jonathan Wentz died unexpectedly and suddenly at the age of 22. Although the loss of her mentor hit Collier hard, she says she is determined to keep his memory and his para-equestrian legacy alive. “He’s always been a huge part of my story and journey,” says Collier, who lifts the sleeve of her dressage show coat to reveal a rubber bracelet bearing the phrase JONATHAN RIDES ON. “I ride with one of his Paralympic pins, and I ride with a picture of the two of us in my pocket so I can always keep him close. “A huge part of my journey is carrying on his story,” Collier continues. “It’s like I’m carrying on his hope to grow the [U.S.] junior/young rider para program. For me, it’s so inspiring seeing all these other riders who have reached their goals. Sydney Collier and Willi Wesley at the June 2014 USEF Para-Equestrian Dressage WEG Selection Trials and National Championships. Photo copyright SusanJStickle.com. Wylie, TX – July 31, 2014 – Horse Radio Network’s once-a-month Para-Equestrian Show featured U.S. World Equestrian Games (WEG) Athlete Sydney Collier and her WEG groom Amy McIlwham. Lindsay McCall from the United States Para-Equestrian Association (USPEA) hosted the show with co-host Ellie Brimmer. To listen to episode #270, please visit: http://dressageradio.horseradionetwork.com/2014/07/31/dressage-radio-episode-270-para-dressage-preview-weg-2014/. About Sydney Collier: Sydney Collier of Ann Arbor, Michigan, will represent Grade Ib for the USA at the 2014 Alltech FEI World Equestrian Games. This will be her first World Equestrian Games. Collier will be riding Victoria Dugan’s Willi Wesley, a 2000 Warmblood gelding. At age seven Sydney was diagnosed with Wyburn-Mason Syndrome after she began having blurry vision. Wyburn-Mason Syndrome is a rare, congenital disorder characterized by arteriovenous malformations in the central nervous system and retina. It affects only .14% of the world’s population and can cause brain hemorrhaging, stroke, paralysis, or death. In 2010 at the World Equestrian Games in Lexington, KY, Sydney and her family ran across young para-equestrian Jonathan Wentz. Wentz introduced Collier to trainer Kai Handt and veteran Paralympian Hope Hand who is President of the United States Para-Equestrian Association. Not long after the 2010 World Equestrian Games Collier began training as a Para-Dressage rider eventually pairing up with Paralympic Dressage coach Wes Dunham of Millbrook, NY. In 2012, young rider Collier had not yet reached her 16th birthday before the 2012 Paralympic Selection Trials but she did earn the opportunity to compete at the 2012 USEF Para-Equestrian Dressage National Championships. The valuable experience of showing at the National Championships that year gave her the verification she needed to know that she was ready to aim for the 2014 WEG. Collier and her coach Wes Dunham have been working together over the past two years creating the perfect partnerships with multiple mounts. Collier began riding Wentworth (owned previously by Amy McIlwham) in 2013 and competed internationally with her horse that same year. In 2014 Collier added two new mounts to her line-up scoring top rankings in Grade Ib. This will be Collier’s first overseas trip for Para-Dressage and a dream come true for the young athlete. 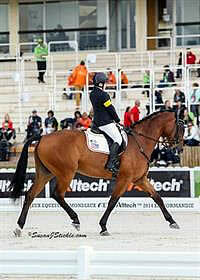 About Amy McIlwham: McIlwham began riding at the age of 7, at a stable close to her house in Ottawa, Ontario, Canada. In 2000, she began training with Ruth Koch out of Oxford Ridge Stables in Kemptville, Ontario. Ruth generously loaned McIlwham her Grand Prix horse Favorit, and she successfully competed him at the FEI Junior level for several years. Not long after, McIlwham was offered the ride on Marzipan, a Hanoverian stallion owned by one of Ruth’s clients. She competed him for 5 years taking him to Dressage at Devon at the FEI Junior level in 2004, and to the NAJYRC twice at the FEI Young Rider level in 2005 and 2006. “I was so lucky to have such generous people around me, and such wonderful horses to teach me so much through my Junior and Young Rider years,” said McIlwham. 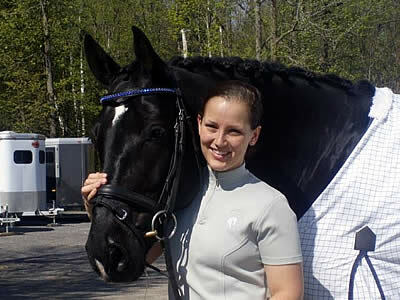 After graduating from the Young Rider ranks, she purchased Wentworth, a 4 year old Hanoverian gelding, from Germany. 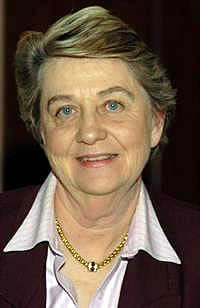 The pair worked alongside Ruth and her other coach, Albrecht Heidemann, to develop Wentworth through the levels. He competed through second level with scores consistently in the high 60s-70s, before becoming a new partner for Sydney in the Fall of 2012. McIlwham has a Bachelor of Arts in Public Affairs and Policy Management and a Master’s degree in Conflict and International Security. Currently, she works full time for the Canadian government as an Analyst for Aviation Security, and she still rides as often as she can. Sydney Collier and Willi Wesley at the 2014 Adequan Global Dressage Festival CPEDI3*. Photo by Lindsay Y. McCall. Gladstone, NJ – May 31, 2014 – In less than a week the 2014 USEF Para-Equestrian Dressage National Championship and World Equestrian Games Selection Trials will occur June 2-5, 2014. Para-Dressage athletes from around the United States will meet at the USET Foundation Headquarters in Gladstone, NJ for their opportunity to represent the United States in Normandy, France. Over the year equestrians have prepared by traveling around the world to multiple Para-Equestrian Dressage competitions. One of those athletes includes young rider Sydney Collier (Grade Ib) of Ann Arbor, Michigan. Collier participated in the 2012 USEF National Championships but was unable to compete for the London Paralympics since she was under the minimum qualification age of 16. The 2013 through 2014 calendar has been a year of intense preparation, thousands of miles, and multiple trips down the centerline. Earning the Jonathan Wentz Memorial Scholarship Fund in 2014 helped Collier in 2014 before the Selection Trials/National Championship. The Jonathan Wentz Scholarship Fund was established to continue the dream of Paralympian Jonathan Wentz, to advance High Performance Para Dressage in the USA by supporting and encouraging USA Para Dressage Young Riders to set the goal of International competition. Scholarship funds go toward assisting USA Para-Dressage High Performance Young Riders (ages 16-25 within the competition year), who are actively competing in 3* and above International Para-Dressage competitions, and have qualified for the U.S. Young Rider Para-Equestrian Championships. Funds are awarded to help offset competition expenses up to $1,000.00 per competition to help cover entry and other fees including stabling and/or shipping (must be greater than 500 miles one way) costs for competition. The 2014 calendar year has been one of the most competitive years in history for U.S. Para-Dressage. The 2014 USEF Para-Equestrian Dressage National Championship and Para-Dressage Selection Trials for the Alltech FEI World Equestrian Games™ (WEG) will showcase that. The Trials/National Championship will be held June 2-5, 2014, at the USET Foundation Headquarters in Gladstone, NJ. Twenty-four horse and rider combinations were recently invited from Grades Ia, Ib. II, III, and IV. Riders had through May 31, 2014 to qualify. Athletes will be vying for not only a spot on the U.S. WEG Para-Dressage Team but the championship titles of the year. Riders have through the end of May to continue to qualify for this event. The ground jury includes President Kristi Wysocki (4*) USA, Adrienne Pot (3*) USA, and David Schmutz (4*) USA. The 2014 USEF Para-Equestrian Dressage National Championship and Para-Dressage Selection Trials is managed by Connie Davenport. The Jonathan Wentz Scholarship Fund was established to continue the dream of Paralympian Jonathan Wentz; to advance High Performance Para Dressage in the USA by supporting and encouraging USA Para Dressage Young Riders to set the goal of International competition. At age 13, Jonathan set the goal of riding for the USA in the Paralympics. At age 16, he established a plan and budget to achieve his dream. At the age of 21, Jonathan was able to achieve his dream of riding for Team USA in the 2012 London Paralympics earning the highest placing of all USA equestrians that competed in London. Another goal of Jonathan’s was to develop a Para Dressage Young Rider program to help grow and improve Para Dressage in the USA. His scholarship fund will be used to offset the cost of YR Championships and International competition for Para Dressage Young Rider’s and to encourage their participation enabling them to excel in their sport. Scholarship funds will go toward assisting USA Para Dressage High Performance Young Riders (ages 16-25 within the competition year), who are actively competing in 3* and above International Para Dressage competitions, and have qualified for the U.S. YR Para Championships. Funds shall be awarded to help offset competition expenses up to $1,000.00 per competition to help cover entry and other fees including stabling and/or shipping (must be greater than 500 miles one way) costs for competition. Scholarship funds are intended for direct payment of specific competition expenditures, entry fees, stabling, and/or shipping only. Checks made out to athlete or immediate family for reimbursement will require a completed W-9, and will be subject to approval. Scholarship funds may be awarded for a maximum of two CPEDI3* events per competition year or the YR Para Championships & one CPEDI3* with a maximum of $1,000.00 awarded per competition. Grants are subject to the approval of the USPEA board. Funds will be awarded based on “own horse” (according to FEI Para definition), distance to competition, number of competitions athlete is planning to attend in 2-year competition period, competition record, number of applicants and/or funds available. This trophy was established in memory of Paralympian Jonathan Wentz, to recognize a USA Para Equestrian ATHLETE (includes Para Dressage, Para Driving, Para Vaulting, Para Jumping, and Para Reining) who has competed and excelled in multiple International Competitions and received scores that contributed to the USA Individual and/or Team ranking on the FEI ranking list during the competition year. This individual has also served as a role model in advancing the sport in the USA, and educating the public on the discipline. Paralympian Jonathan Wentz, at the age of sixteen, established a plan to achieve his goal of representing his country at the Paralympics. Toward that goal he tirelessly trained and competed as a high performance Para Dressage athlete for the USA. He tenaciously pursued his goal while working to improve his sport through serving on USEF committees, giving riding demonstrations, public speaking and mentoring new riders. Jonathan felt it was extremely important for the growth of the sport for Para Equestrian High Performance athletes, to be recognized as athletes without regard to their disability, to be viewed parallel to Olympians. To achieve this level a Para Equestrian must be committed to training & competing consistently at the highest level, like their Olympic counterparts. It also requires a commitment to improving the sport and educating the public on all Para Equestrian disciplines. The Jonathan Wentz Memorial Perpetual Trophy recognizes the USA Athlete’s excellence in competitive Para Equestrian sport at the International level. This award honors USA athletes who serve as a role model for their sport and it commends those equestrians who help to advance Para Equestrian sport in the United States. USPEA and designate: “JW Trophy” in the memo. Use your Credit Card or PayPal by going to www.USPEA.org. Click on the “Donate Now” button and designate “JW Trophy” in the message section.